engineers around the world. 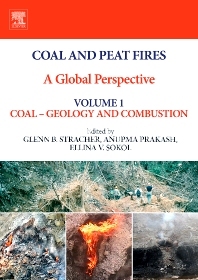 The first of four volumes in the collection, Coal – Geology and Combustion, features chapters that discuss the origin of coal and coal fires; mining and use of coal; combustion and coal petrology; environmental and health impacts of coal fires; combustion by-products; geochemical, geophysical, and engineering methodologies for studying coal fires; the control, extinguishment, and political implications of coal fires; and much more. Dr. Glenn B. Stracher is Professor Emeritus of Geology and Physics at East Georgia State College, University System of Georgia, Swainsboro, Georgia, USA. After receiving his M.S. in Geology and a Ph.D. in Geology and Engineering Mechanics from the University of Nebraska, he served as a Lady Davis Scholar at the Institute of Earth Sciences, Hebrew University of Jerusalem, Israel. He was also nominated by the United Nations as a Fulbright Scholar while in graduate school before completing his postdoctoral work in Israel. Dr. Stracher is the former chair of the Geological Society of America’s Coal Geology Division and served on the society’s External Awards Committee. He is the co-author of three chemical thermodynamics books, published in English and Japanese and taught graduate level courses in this subject at the Georgia Institute of Technology in Atlanta. In 2010, he was named a University System of Georgia “Shining Star,” by the state’s Board of Regents, for excellence in research and teaching. In 2015, he was named a Geological Society of America Fellow for his contributions to coal-fires science. Trained as a structural geologist, mineralogist, and metamorphic petrologist, the main focus of his research since 1995; and for which he is internationally known, is coal fires burning around the world. In addition to numerous peer-reviewed publications about coal fires, he has convened coal-fires symposia with the American Association for the Advancement of Science and the Geological Society of America (GSA), and led four GSA National coal-fires field trips. Dr. Stracher is the editor of the Geological Society of America book, Geology of Coal Fires: Case Studies from Around the World. He also edited the International Journal of Coal Geology special publication, Coal Fires Burning Around the World: A Global Catastrophe. The China University of Mining and Technology in Xuzhou, Jiangsu, has invited him to teach short courses about coal and peat fires using this four-volume book. He has also received an invitation to visit and do research at Tianjin University in China. Dr. Stracher appears in two National Geographic Channel (NGC) movies about coal-fires: Wild Fires, part of a seven part NGC series entitled Built for Destruction, and the more recent movie, Underground Inferno, that has won several international film-festival awards. Currently, he is working with historian Timo Hauge at the German Mining Museum in Bochum, Germany, on a permanent display about mine fires. The display in the 37,000 square foot museum will open in 2018 and feature much of Dr. Stracher’s work, as well as photos taken by Glenn and Janet Stracher during their numerous field expeditions. The German Mining Museum is the most famous mining museum in the world. The web address of the museum is: http://www.bergbaumuseum.de/index.php/en. Dr. Glenn B. Stracher and his wife, Janet, were recently the guests of four universities in China, where Dr. Stracher gave six presentations. In addition to the 2,000 page, four-volume book Dr. Stracher published with Elsevier, entitled Coal and Peat Fires: A Global Perspective, he recently signed a contract with the company to publish a fifth volume entitled Coal and Peat Fires: New Global Perspectives. The latest work is scheduled for publication late in 2017 or 2018. The fifth volume will include contributions from engineers and scientists in China. The Strachers have been invited to return to China at a later date, where Dr. Stracher would serve as a visiting professor at the China University of Mining and Technology and the Xi’an University of Science and Technology. Anupma Prakash is Professor of Geophysics (Remote Sensing) at the Department of Geosciences and the Geophysical Institute, University of Alaska Fairbanks, USA. After receiving her M.Sc. degree in Geology from Lucknow University, India, and a Ph.D. in Earth Sciences from the Indian Institute of Technology – Roorkee, India, she moved to the Netherlands to work for the International Institute of Geo-information Surveys and Earth Sciences (ITC), Enschede, The Netherlands. She is internationally recognized for her research on the use of remote sensing and geographic information system (GIS) techniques for investigating surface and underground coal mine fires. Her coal fire research involves fire detection, mapping, monitoring, depth estimation, characterization and quantitative estimation of environmental impacts. Ellina Sokol is a distinguished research scientist at the Institute of Geology and Mineralogy of the Siberian Branch of the Russian Academy of Sciences in Novosibirsk, Siberia. "This is one of the most comprehensive books ever published on the important topic of coal and peat fires.